Designed And Used By Producer Of Hunting Videos, Outdoor Speaker And Bow hunting Instructor! 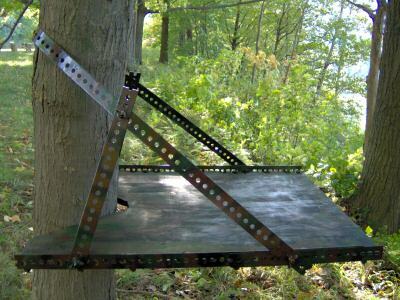 This Do-It-Yourself Tree Stand is easy to build and put up, yet rugged and durable! Build six sturdy Tree Stands for the cost of one expensive factory-made stand! Fun to build! Great father-son or father-daughter project or a "before the season get-together" project for a group of hunting buddies! Now you can afford to have many different stands set up in different locations to keep scent and traffic out of your favorite spots! These are plans and instructions to build the Tree Stand shown in the photo above. Please note that you are buying only the plans and not a finished Tree Stand. Materials needed to build the stand are not included -- the materials can be purchased at any hardware store and lumber yard near you. This ingenious Tree Stand is safe, affordable, durable, simple to build, easy to put up and adjusts to fit trees of many different sizes. Outdoor speaker Dave Tripiciano has developed, refined and field tested this stand over the past seven years. Mr. Tripiciano and his son hunt almost exclusively from this type of homemade stand and have taken many deer from them with bow and gun. They currently have 15 of these stands set up in two counties in Upstate New York. Some of them have been in the woods for more than five years and are still useable. Dave Tripiciano films, produces and markets professional Hunting and Outdoor Videos and he is the founder of "My Father’s World" Video Productions. He is a sought after Christian guest speaker presenting seminars on Bow Hunting and Whitetail Deer Behavior to large groups of outdoorsmen throughout the Northeast. Mr. Tripiciano has also served as a New York State Bow Hunter Training Instructor for many years. With the addition of foot straps this stand could be easily converted into a Climbing Tree Stand. The designer has never used this stand as a Climbing Stand but predicts that it will work well. It is recommended that the hunter practice climbing up and down with it first close to the ground. Although the designer and his son are small in stature and relatively light in weight, one of their hunting buddies who weighs 280 lbs. has hunted safely from this Tree Stand on several occasions with no modifications. We do recommend for your safety however that persons over 225 lbs. take additional precautions and add extra support and hardware to beef up the structural integrity of the stand. Please Note -You Are Buying Only The Plans To Build This Stand! We have hunted safely from these stands for many years, but because we cannot control the assembly of the stand, the quality of the materials used, or how it is put up, we make no promises or guarantees for your safety or the safety and structural integrity of your tree stands! Anyone purchasing these plans and building and using this Tree Stand does so completely at their own risk! Dave Tripiciano and "My Father’s World" Video Productions make no guarantees expressed or implied for your safety and are not responsible or liable in the event of any injury sustained by anyone when building or using these Tree Stands! For your safety always wear a safety harness or safety belt in this and any other Tree Stand. Be extremely careful climbing both up and down, especially after hitting a deer! Try to avoid climbing up or down in total darkness whenever possible! Tree Stand Plans Sell For $7.77 And Include A FULL Money Back Guarantee. Shipping & Handling For This Item Is Included In The Price.